Goodmans GFSAT200HD review | What Hi-Fi? 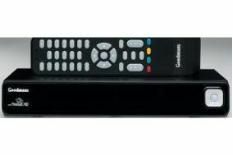 Though there's little to choose between the three Alba Freesat boxes – that's the Goodmans here, the Grundig GUFSATAT01HD and the Bush BFSAT01HD – the fascias are marginally different. It's a personal preference, but we reckon the Goodmans is the best-looking, with its neat arrangement of buttons in a diamond shape. The Goodmans is also amazingly dinky: it cuts another couple of centimetres off the width and depth, making it even easier to house on a small or cluttered equipment rack. The remote control is far from exciting to look at or hold, but it's perfectly functional and fairly ergonomic. Plug it in and HD channels are very sharp and largely noise-free, while standard-definition channels look just a touch soft next to those from Sky – particularly when looking at a challenging broadcast such as Channel 4 Racing. It's also worth mentioning that when you change channels, the optical cable does carry a few clicks to the speakers as the box locks onto the new sound signal, but this ceases after just a couple of seconds. However, much like its two siblings, it's the overall usability that sees us marking down the Goodmans box. Those menus aren't as well thought out or presented as those from the Humax Foxsat-HD, and the problems we had with set-up make us a little nervous.